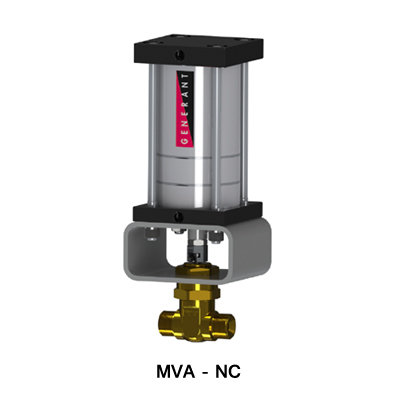 The Series MVA Pneumatically Actuated High Pressure Gas Control Valve is optimized for the demanding requirements of Automated Gas Cylinder Fill Plants, Manifold, and Piping System applications. The High Pressure Oxygen Service Valve Configuration (Seal Option C) was third party tested per ISO 7291 (O2 Surge) and ASTM G175 (Promoted Ignition). 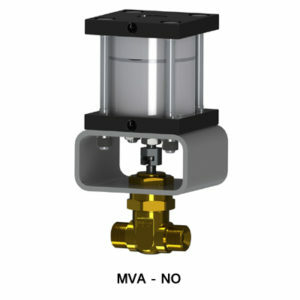 The valve is also available with a PCTFE seal (Seal Option K) for positive sealing in non-oxygen applications. 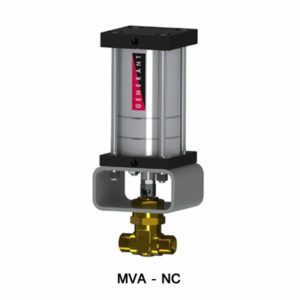 Series MVA valves can be specified Normally Open (-NO) or Normally Closed (-NC) and are available in a variety of porting configurations. Normally closed version seals bubble-tight up to an inlet pressure of 5500 PSI with only 85 PSI required to open valve to full orifice.